JaCalIVE provides a method to develop this kind of IVEs along with a supporting platform to execute them. JaCalIVE is based on the MAM5 meta-model Figure 1 which describes a method to design IVEs. 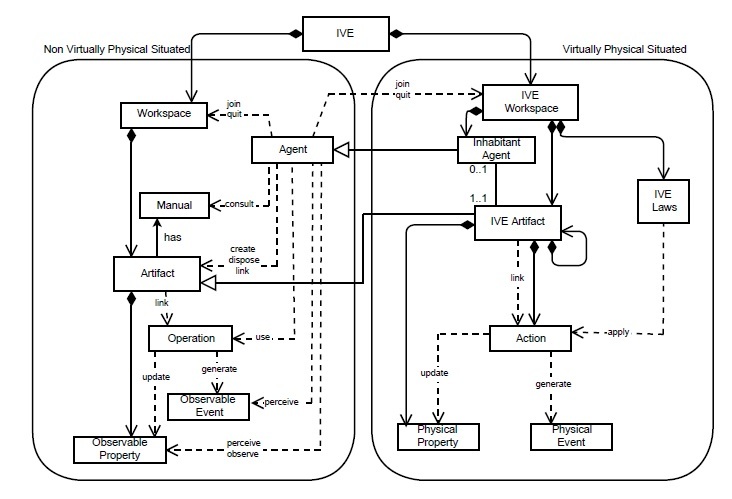 MAM5 is based in the A & A meta-model that describes environments for MAS as populated not only by agents, but also for other entities that are called artifacts. According to this, an IVE is composed of three important parts: artifacts, agents and physical simulation. Artifacts are the elements in which the environment is modelled. Agents are the IVE intelligent part. The physical simulation is in charge of giving the IVE the look of the real or physical world, allowing to simulate physical fenomenal such as gravity or collision detection. In the last years, there have been different approaches for using MAS as a paradigm for modelling and engineering IVEs, but they have some open issues: low generality and then reusability; weak support for handling full open and dynamic environments where objects are dynamically created and destroyed. As a way to tackle these open issues, and based on the MAM5 meta-model, we have developed the JaCalIVE framework. It provides a method to develop this kind of applications along with a supporting platform to execute them. Figure 2 shows the steps that should be followed in order to develop an IVE according to the JaCalIVE framework.